Who is John Marc Desengano? 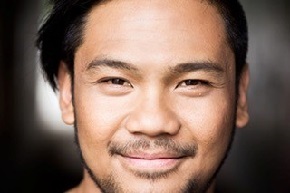 John Marc Desengano is a 29 year old Asian-Australian actor who loves to laugh and laugh with others. He has an unhealthy obsession with cooking shows, yet isn’t very good at cooking. He still lives at home with his parents as he loves his parents and it’s more financially viable at the moment. Don’t judge him! I’d stop living with my parents. There are a lot of famous people that inspire me, although I’ve found inspiration in local artists and friends who work tirelessly for little reward and recognition. I appreciate their influence on me, as I don’t just admire them from afar but I can easily approach them for advice and guidance. As a primary school teacher, I strive to make lessons enjoyable and engaging in order to foster a passion for learning in young people. I’d like to be a positive influence on their lives and hopefully they can go on to make a difference in the world. Favorite holiday destination and why? Japan. Always something to see, always something to do, and always something to eat. Everything is vibrant, unexpected and overwhelming in the most incredible way. You can’t say something bad about Japan. Try it! You just can’t. I really enjoy those escape rooms. I’ve done a few and there are heaps in Melbourne. Not only are they fun, but they really highlight what your friends are like in high pressure situations. And then you can choose if you still want to be friends with them. I just finished the Reckoner series by Brandon Sanderson… what a twist! That’s all I can say. I’ve just rediscovered the magic that is Justin Timberlake’s Justified album. Catching up with mates over pancakes at 11.30am on a weekday, while discussing last night’s episode of MasterChef. Love… hopefully… and laughs! Lots of laughs and laughing. And hugs as well. Laughing while hugging. That’s what happiness is. Can I change my last answer?